Havens Metal is the premier American manufacturer of Copper and Stainless Steel sinks for the kitchen, bath, and bar. 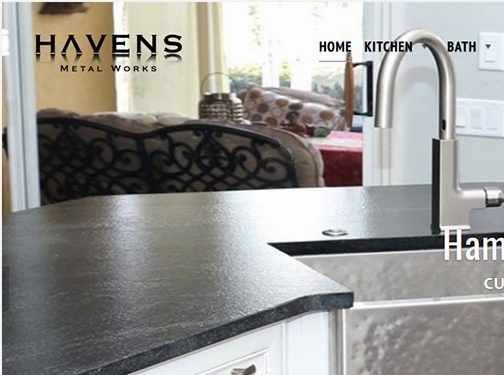 With a vision to develop advanced metal products and work directly with the home owner, we've built the Havens Metal brand as a platform where customers have the option to select, customize and purchase luxurious home metal products with ease. Known Worldwide for our reputation, Havens Metal is a prestigious result of four generations perfecting the craft, innovating luxurious designs, and mastering the art of custom sheet metal. The Havens legacy, our reputation for skilled craftsmanship and top-quality metal products, began in the late 1940's when Tom Vickers discovered his passion and talent for forming metal. As a skilled sheet metal worker, he had the opportunity to complete thousands of elite level projects, working directly in the trade to make the Vickers name the very foundation of all things high-end sheet metal. Tom's talent and passion has been carried on through his son, Tim Vickers, who began learning the ins-and-outs of sheet metal from his father at a young age. Working side by side for many years, the father-son duo built up the well-known Vickers reputation for top craftsmanship across. With a shared vision to provide each customer with unparalleled quality and service, they established their own metal shop, our parent company, Vickers Metal Works, in 1984. US (Orlando, Florida) based business - established in 1999 - providing copper and stainless steel sinks. Website includes e-commerce facilities, delivery and returns information, work examples, testimonials, news section, associations, full contact details.